If you live in the Vancouver area and you love video games, it looks like you're in for a treat. Meet the Geekenders. They're a troupe of geeky performers who put on monthly variety shows that include song-and-dance segments, burlesque, contests and more. In the past they've produced unofficial shows based on Star Wars, Batman, The Princess Bride, Harry Potter, The Lord of the Rings and more. At the end of January, the Geekenders have something very special planned. For this month, they're taking a break from their usual variety show and putting on a musical based on Portal 2. (Valve Software is not involved in any way.) Of course, any interpretation of Portal 2 on a small budget would have to cast humans in the robot/A.I. parts, but if you can make that little leap, it looks like it's going to be a crazy good time. Check out this video of the cast rehearsing. 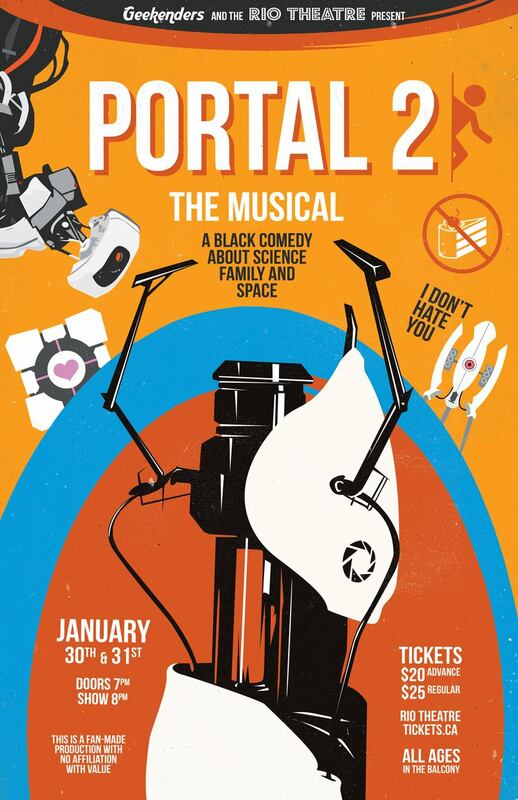 Portal 2: The (Unauthorized) Musical will have two showings on January 30 and 31, 2015 at Vancouver's Rio Theatre. Tickets are $20 in advance or $25 at the door, and can be purchased here. If you plan on going, keep this in mind: Attendees of Geekenders shows are encouraged to show up in costume. 'The Empire Strikes Back' LIVE: Aaron Paul As Jedi Luke Skywalker? Yo, Yoda!